Welcome to the NEW Merijns Projects. Home of all Merijn's crazyness. Like the name already says: a collection of all Merijns Projects. I make royalty free music which is downloadable for free. This music is also used in my video's on Youtube. One of the highlights on Youtube is my Lego Ceiling Train. 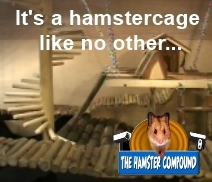 A later project is The Hamster Compound. A Big Brother style hamster cage fitted with 18 camera's. Merijn also offers sophisticated Web and Application development.